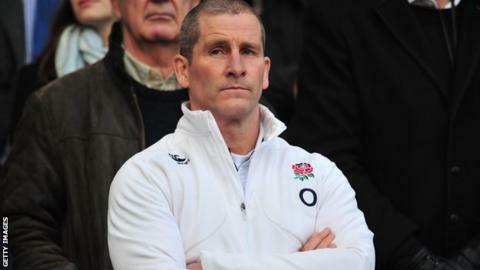 England head coach Stuart Lancaster has signed a new contract with the Rugby Football Union that will keep him in the job until 2020. The deal will take Lancaster through the next two World Cups, including the 2019 tournament in Japan. The 44-year-old was appointed in 2012 on a contract until January 2016. Lancaster's coaching team, Graham Rowntree, Mike Catt and Andy Farrell, have also had their deals extended to the end of the 2019-20 season. The announcement comes a year before England's World Cup opener with Fiji at Twickenham on 18 September 2015. England are in Pool A along with Wales, Australia and the winner of the play-off between Russia and Uruguay. "It's not that unusual because Wales have done something very similar with Warren Gatland. Lancaster has barely put a foot wrong in his three years in charge so far, but it is still a pretty massive show of faith in Lancaster and his coaches to say that whatever happens in the World Cup next year, and even if the World Cup is a disaster, you are still the man to take us through to the next one." "It's great that the RFU have got faith in us as a coaching group and its support has been critical to what we have achieved to date," Lancaster said. "While our focus is on the QBE International against New Zealand, and the 2015 World Cup on home soil will be a once-in-a-lifetime opportunity, we want to build a team for England Rugby that leads into Japan in 2019 and beyond. "We believe that England Rugby is moving in the right direction, we have the right coaching and management team to take us forward and are excited about the challenge ahead." Lancaster took charge as interim head coach from Martin Johnson after England's disappointing quarter-final exit from the 2011 Rugby World Cup. He was awarded a permanent deal following his side's second-place finish in the 2012 Six Nations. England have gone on to achieve two more Six Nations runners-up spots under Lancaster, missing out on points difference in 2013 and 2014. The former schoolteacher has overseen 30 matches, winning 18 and losing 11 - a 60% win rate. RFU chief executive Ian Ritchie told BBC Radio 5 live: "I think it's the right leap of faith. It's a commitment to sustainable success we believe, and it's a two-way commitment." He added: "We are lucky to have a talented, committed and passionate coaching group. "Coaching at international level is unique in that the time Stuart and the coaches have with the players is limited and in that regard it requires a special and stable coaching team. "We therefore felt it important to secure their long-term future and we believe this is entirely the right decision for the future of England Rugby." Should Lancaster fulfil the entirety of his new contract, he would surpass Sir Clive Woodward's record as the longest-serving head coach of the England team.